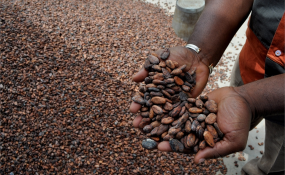 Ghana and Cote d'Ivoire are working together to address the unfavorable global cocoa pricing regime to reduce the vulnerability of both nations to the volatility of the markets, President Nana Addo Dankwa Akufo-Addo has said. He described as "manifest injustice" the situation where, for the 2015 Crop Season, both countries earned for their output, which accounted for 65 per cent of the worlds cocoa production, only 5.75 million dollars at a time when the global market was worth some 100 billion dollars. "This means that our farmers, through whose toil and sweat the cocoa industry was founded, earned 5.75 per cent of the global value chain of the industry... this is manifest injustice. It cannot and should not continue. "We will not continue to be victims or pawns of the global cocoa industry that is dependent on the work of our farmers," he said in Accra at a State Dinner hosted by him in honour of Ivorian President Alassane Ouattara at the Accra International Conference Centre. The highlight of the evening's event was the conferment of the highest State Award of Companion of the Star of Ghana, Honorary Division, on President Ouattara in recognition of his "exceptional leadership and incomparable commitment towards deepening the close friendship and cooperation between Cote d'Ivoire and Ghana". President Akufo-Addo said he and his Ivorian counterpart had decided to work to provide the necessary leadership for technical and political cooperation that would effectively address the international cocoa price decline in the short-to-medium term. He said they both were fashioning far reaching policies towards achieving a shared vision of an industrialised and prosperous cocoa economy, saying; "This would reduce our vulnerability to the volatility of the market and help deliver prosperity to our farmers and people." President Akufo-Addo reiterated the high priority Ghana placed on her relationship with Cote d'Ivoire, emphatic that; "If we work together and harmonise our policies, we can protect our farmers and guarantee a better life for them." "We are amongst the biggest economies in West Africa, we are bonded by common history, by common ethnic ties, by common culture and by common geography... these ties impose on us the necessity to work together and to live as good neighbours with each one being the others keeper," he said. Whilst commending the Ivorian leader for his show of statesmanship in the verdict of the delimitation of the maritime boundaries of both countries, President Akufo-Addo noted that though both countries had accepted the judgement, what was of paramount importance was the peaceful exploitation of the maritime resources for their benefit. He called for stronger collaboration between Ghana and the Ivory Coast to ensure the full engagement of their other sister countries in the process of West African integration to make the bloc a strong regional economic player. President Ouattara, on his part, expressed gratitude to the Government and people of Ghana for the outstanding show of hospitality extended to him and his delegation. "It is a testimony of the traditional and legendary hospitality of the Ghanaian people," he said. He said his visit to Ghana exemplified the strong bonds between both countries and their shared determination to inject a new momentum into the co-operation between Cote d'Ivoire and Ghana. He stressed the need to "accelerate actions to intensify and strengthen the new type of partnership that both countries strived to establish for their people. President Ouattara said the productive and constructive interactions he had had with President Akufo-Addo, since assuming the reins of governance, had allowed him to appreciate the seriousness his Ghanaian counterpart attached to the bilateral relations between both nations. He gave the assurance of his firm commitment and total willingness to continue to work to strengthen the privileged relations between both countries and their peoples.